Players aim to strike cone with ball, taking turns. Players should look to strike ball with laces using appropriate technique with an emphasis on power and accuracy. 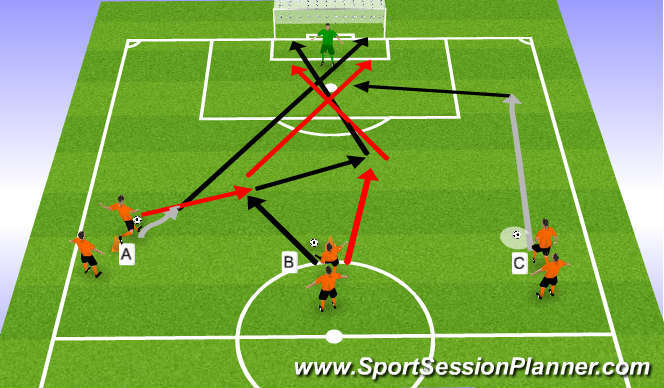 A passes to B who sets for C to strike on goal Emphasis on speed of routine, correct set for player to strike and then accuracy and power of shot. "If one pass is poor, final product will be poor". C should be encouraged to step into the ball. Players move round to next station after each shot. Progress to first-time shot, movement round cone or 1-2 between C and A. A takes positive first touch out of feet and strikes on goal. 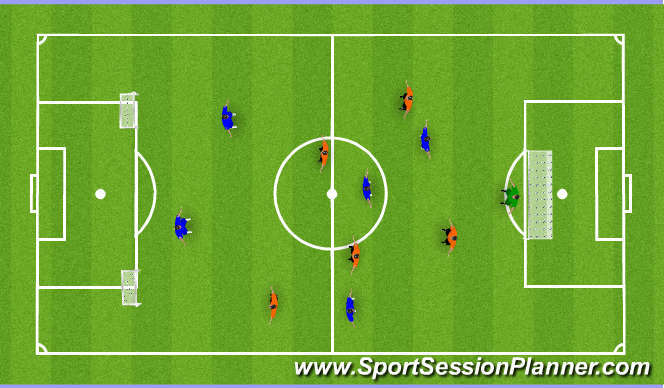 A then turns and plays 1-2 with approaching B who goes on to strike on goal. C then dribbles down the line and crosses for A and B to attack. A should first be encouraged to take positive first touch and strike ball at power from distance. Turn should then be fast with positive pass through for B. B should work at pace and focus on accuracy of finish when in one on one situation. 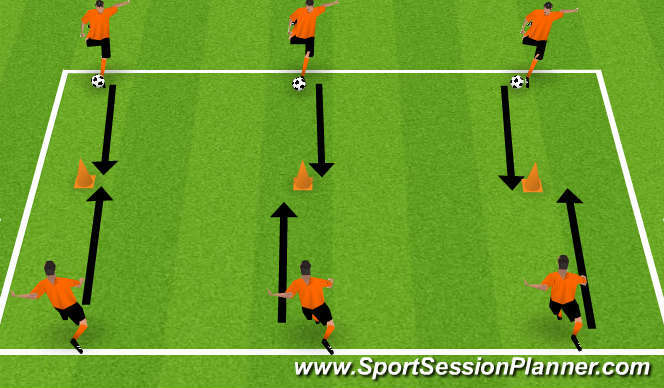 C should concentrate on wide dribble, quality of delivery in picking out running of A and B. Runs into the box should be timed to meet ball, then progress to crossing runs to posts. Exercise should be done quickly to encourage realistic element. One team to attack one full sized goal with goalkeeper, other team attacks two empty mini goals. Both teams are encouraged to shoot at every opportunity which presents itself, accuracy, power and correct technique being emphasised at all times.